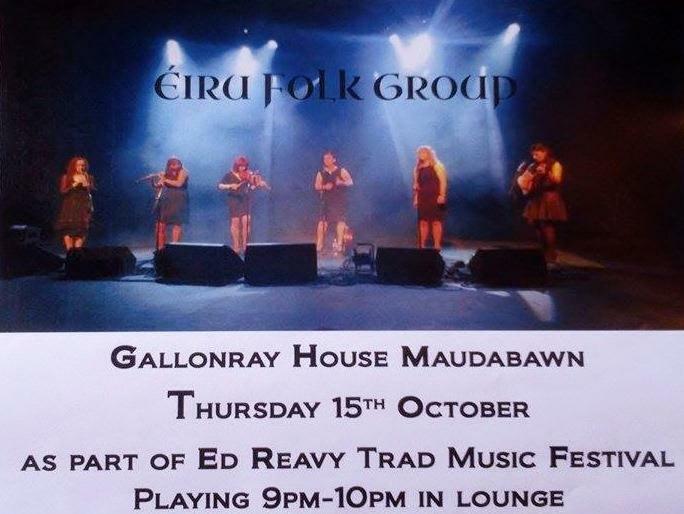 This is our opening session, based in Ed Reavy’s native Maudabawn and will feature ÉIRU PLUS a host of local artists supported by members of Cavan Town CCE and various other CCE branches throughout Cavan and Monaghan. It will prove to be a wonderful night filled with Music, Song and Dance. Cavan Crystal Hotel 6.30 pm till 8.00 pm: Open Lobby Session led by members of Cavan Town CCE. Cavan Crystal Hotel 10.30 pm till late: Open Lobby Session following on from the Comhaltas Concert Tour and let by members of the touring group. 5.30 pm: Singing Session in The Meadowview Inn, Dublin Road Cavan, led by Aoife Murray, Theresa McManus, Gerry Hennessy and Seamus Fay. 5.30 pm: Music Session in The Lobby of Cavan Crystal Hotel, led by a number of the Music Tutors, Marin Gaffney, Bernadette NicGabhann, Antoin MacGabhann, Sean Gilrane, Brenda Castles, Daithí Gormley, Paddy Ryan. 6.30 pm: Uilleann Piping Session in The Lobby of Cavan Crystal Hotel, in recognition of International Uilleann Piping Day, featuring a host of local Uilleann Pipers from Cavan and surrounding counties. 11.00 pm: Music Session in The Lobby of Cavan Crystal Hotel, led by members of Shaskeen, Grainne Brady as well as a number of the Music Tutors. 4.00 pm: The Farnham Arms Hotel: Singing Session led by Ted Sweeney, Mickey McDonnell, Patsy Cassidy, Marion Crowe, Theresa McManus. 5.00 pm: Blessings Bar: Music led by Pat Tierney (Flute/Whistle), Enda McDermott (Banjo), Alan Maguire (Bouzouki), John Quinn (Accordion), Paddy Haren (Bodhran).